Congrats to Jen....this is well deserved recognition for her talent and style. The word is Jen will be teaching Martha to make something fun for spring....so don't miss it! 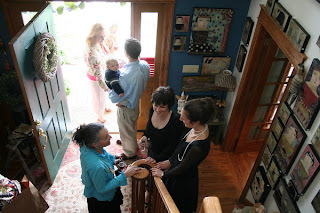 Here is Jen pictured with friend and fellow artist Letty Worley and her Mom, Pat Murphy at my home last fall. Love those talented gals! Here is friend and fellow collector, lover of teddies, dolls, folk art, and all things pink and green...Rosanna DeBellis, and her beautiful daughter Nicole, of Mantova, Italy. They have visited us in Warwick 3 times and I need to get to Italy to see her amazing home and collections. Thanks Rosanna for the pictures shared here...there are so many more...and we will be sure to post them over time so that all can enjoy...what a collection! How totally yummy and PINK!!!! And yes, we can think pink can't we!!! Rosanna takes decorating, and the color pink, to new heights...just look at the wonderful stacks of sweaters festooned as they sit in the wardrobe... she lives with art all around her, wears it, shares it, loves it! Little Nicole is just as fond of the pink and green theme and here are some images of her bedroom...pink and pink and more pink...every shade...how wonderful! Delicious, devine, delightful, delirious, de-lovely and DeBellis! Here is the question begged in RED letters from my dining room hutch... May I try; will I love it; can they alter art? May we take something and add to it, meld textures and forms, time periods, the old with the new? Can we enjoy something...maybe not as it was initially intended...as art? The temptation to alter what is already there, make it better, make it whimsical, make it our own.... It's a lush concept, dribbled with funky nostalgic components, texture and sentiment. 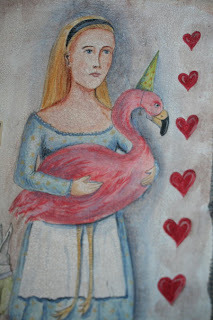 ALteReD aRt just might be kitsch's little sister....and we already know I love KITSCH! In the realm of the wearable, Dara DiMagno bravely alters yesterday's photo art. I am so drawn to her work, wearing one of he pieces almost daily. They are kaleidoscopes of vintage metal, found objects and forgotten faces. Old silver utensils, odd findings, scraps from long-ago played games, tin types and old photos, steel cut Victorian buttons, Bakelite charms and baubles galore...to these she layers quips and monikers in collaged fonts. The altered elements emerge as charming stories...fancifully adorn what was there... and making it her own. And in her series called "queens of kitsch", Ashley Carter takes 1940s paper dolls and creates a realm of frothy millinery flowers and faux confections as skirts, wands and more...how fun and what an altered use for paper dolls... and I am quite sure those vintage hat ornaments never thought they'd be turned into fairies' wands and party centerpieces! These artists alter materials to make their own creations....and I have fallen in love with them for it. I admire their bravery, their whimsy and their STYLE! Assemblage art is often incongruous in its components. It can be unsettling in its perfectly, imperfect matches of texture and form. I find myself in love with certain pieces...you know the ones laden with nostalgia, a bit chippy, their assembled bits the worse for wear but fresh in their new form. Provocative, maybe a bit bedraggled, utterly charming and sometimes just plain silly...these are the ones! I often look at the hutches around my home. Their displays are constantly changing, morphing in the direction of one holiday and then back again. Every once in a while we yell, "Don't touch the hutch!" This means somehow, through some magic, a wonderful 3-d collage has emerged on the shelves. The collected elements have combined in a marvelous soup of a display. This too is what assemblage art is like to me. I love the way it holds it own, heralding it's bright diffidence to conformity and beckoning a reaction. Kitty B is the mistress of assemblage, carefully curating her odd boxes of whimsy by freezing bits of everyday life for inspection. In her art, Kitty elevates castoff tools, misfit toys and leftover tidbits in her celebration of whimsy, selecting and then surrounding them in their own little world of paper and glitter, whimsy and mirth. Calico & Buttons are her two very favorite things, so she’s named these assemblage pieces and framed collages in their celebration. They hang everywhere in my home. New friends, artists Bill & Marcia Finks concoct funky and fun wall dolls from a bevy of metal findings, castoff doll parts, and forgotten bits of yesterday’s everyday. 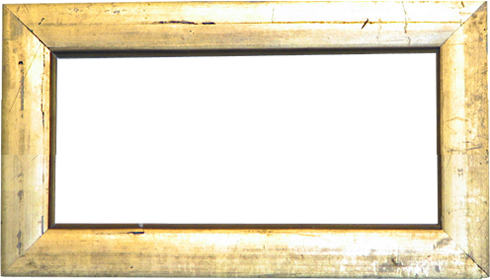 Their assemblages convey movement despite the rusty oddness of their dashingly askew component parts. These two transform broken rhinestone pins, rusty metal bits, remnants of ribbon and curling wire into delights. The new story, told deftly by their assembled parts, creates an appeal that is charming, nostalgic and just a bit sassy. We are thrilled to be working with them and have just posted their creations to our site! Lisa Kaus delves into the depths of assemblage with her tinnies and houses. Wood and metal, findings and paint blend seamlessly in her work. 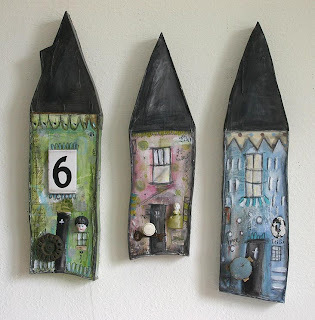 In an earlier blog, I showed a detail of one of her assemblage houses sporting the #7 of my home address....I love her and her work too! I cannot wait for her to visit us in May for the 6th annual Spring Soiree...and Lisa, can I have permission to share some images of you in your studio for a future post...I would love to highlight you and your work! So assemblage art is there for the making. 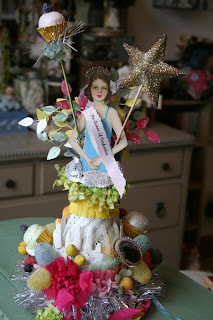 Favorite things collaged, a story to tell in 3-d, memories to hold or create anew, assemblage art makes it possible. And yes I DO WEAR IT! (see prior post!!!) Jill Schwartz's Elements jewelry is assemblage art at its best....just miniature in form. My favorites are the Ovaline Chirp Chain and the Square Beaded Tweet necklaces . Do tell...do you like it, have you made it, do you think it rocks? So you love it, you collect it, you make it, you admire it, you enjoy it, and you share it. You hang it on walls, sit it on shelves, and let it adorn your heart and home. But, do you wear it? 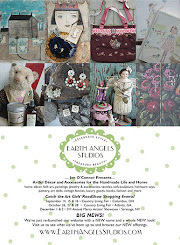 Do you show the world your love of pretty, whimsical and artful handmade things? Do you make each day more your own through the expressive donning of artful baubles? I must admit to decorating myself each day like a cheerfully bedecked Christmas tree. While I feel my wardrobe choices are often limited by the need to dress for battle...I am chasing 3 little ones all day...I never hold back on the accessories. Bangles, big rings, and the pin on my omnipresent denim jacket...these artful pieces of jewelry make me, feel like me, no matter the day, what I wear, or what I might be up to. Party clothes or play clothes, the art goes with me! Here's the vintage candelabra in my master bath, it begs me to try a new necklace each day. My bracelets nestle in an old valise, and my rings and earrings in big chipped bowls. It's a grab 'n go, free for all of texture and color. Felt, metal, fantastic plastic, big beads, little beads, chains, odd bits of yesterday, all are ready to festoon! My beloved dress form, affectionately referred to as "Margarette", was made famous by her recent appearance in the March 2007 issue of "Country Living". I think she looks as good as she did when she was made in 1905. It must be the Elements jewelry! Can you tell I adore Lynsey Walters? How can I not feel good when I wear her happy felt creations. They remind me of her cheerful spirit...ahh, I could listen to that Scottish accent all day...And here's Ulla when we first met at "Halloween & Vine". I fell in love with her and her jewelry at the same time! My first piece from Ulla's hands was a wonderful reliquary pendant/pin entitled "hocus pocus". Look I was wearing a necklace by Nicole Bowen that caught her eye too! 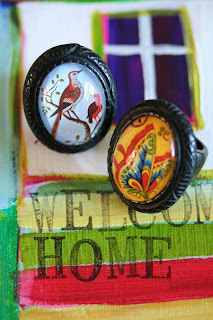 Of course I am thrilled Stacey Bear has started to make jewelry too, as has Leslie McCabe. Each creating in their signature style, but in miniature wearable form! ...have you had a day like this? 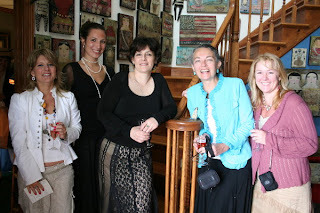 Hi to Ro, Heidi and Jody, here's my sister Roseanna, Nicol and Stacey....and there's Pat and Leslie, oh here's Laurie and her Tasie with Jill, Niole, Nanci, Jodi, two Lisas, Danielle, Judy...what days, what friends.... ahh...I am feeling so much better...Do your friends do the trick every time? Mine do, as do the wonderful memories. Now, if i can only face all those old faces at tonight's event....hmmm well I am going mostly for curiosity's sake...will I still be afraid of the girls who sneaked cigarettes in the bathroom on East Bottom? I went to the largest private high school in the US of A. Yep, St Francis Prep which perches on the LIE in Queens. Run around the building 2x and it's a mile, this place was huge, so were the egos, the offerings and the possibilities (do you watch HBO's "Entourage"? )...but I barely remember it seems so far away... so are the faces in the yearbook...but the ones on my porch are bright and beautiful! ...and I just went to call my friend Diane Allison, she's already up and working this morning, but I cannot use the phone. My "adorable" 20 monther, Rory, decided to dump it into the sink last night. It, of course, landed in the pot that was soaking...ahhh of those days...I will take them all with my friends to cheer me. Kitsch is the chest of wonders from which I can rarely extract myself without stealing a bit of wit and whimsy. Since youth, I have imbibed its one legged plastic dolls, chipped carnival chalkware puppies, and mysteriously tacky tourists' souvenirs from forever ago. Jane...may your bakelite and be-baubled scepter herald (in a 194os typeface...) your indulgence in this medium time and again...be brave..go girl! 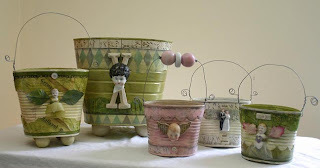 So the blog tour continues....along the way, my beloved treasures, objects, art, and vintage goodies mix with my kitcsh-y bits and encourage me to chuckle at yesterday's whims and face tomorrow with mirth. To me these odd treats are like the fun hors'douerves in my decor, setting off the serious and the pretty with a visual nugget of fun. ...Like the small Gulliver in the land of the giants, I want to jump right into the magic of my collections and live amongst the odd bits of celebrated found objects, art and memories that are curated by my cabinets, shelves and cupboards. There, scale turns dizzy in beloved vignettes, where the odd bit of scrap paper can harbor value beyond gold, and mementos of days gathering curiosities now endure the gracious patina of time. The hutches, perches and wee nooks of my home somehow harness the magic of my collections...they make enchanting showcases of wonderful textures. I find treasured and special items, many that were dear in price, are all the more fascinating over time. What was wrought by the hands with love and care holds my interest still...though often required to make room for new goodies that invariable require a post in the growing displays!! In my bedroom, Brides and their shy Grooms make friends old and new on plates by Jill Shcaefer and wish boxes by Ashley Carter. Here are gal pals Judy (mum to talented Nicole Bowen see the wee cupcake doggie she cradles along with a Jill Kenny teddy), Susan a long time doll friend and great gal pal extraordinaire Dawn strutting their favorite goodies in my bedroom. Thanks again to Nicol Sayre for the fabulous gift of the Alice doll Susan shows off! I have a long time love affair with Alice in Wonderland, and cannot resist her charms and utter scattered whimsy. Along the tour we started on this BLOG yesterday, here is a favorite Alice painting from a whimsy box that hangs in my bedroom. This original work sprung from the imagination and hands of the lovely and talented Stacey Bear...her Momentos realm is fascinating. When I see a new batch of Stacey's work I become intoxicated and beg my home to grow more walls like some odd abode from "Wonderland". ...and as some unknown someone urged the curious Alice, "drink this"
...homes...our homes are our castles where we rule with style and abandon. 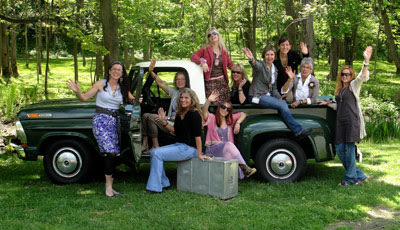 Filled with memories, friends (look at these fabulous gals!) and love...and dare we say...some, or the sum of many, treasured objects. The door to my home opens so many times... to let in friends, boxes of treasures from artists, new ideas, and simply fresh air. ...and it got me to thinking...where do I create? Well, I have a ramshackle desk here in my kitchen at #7 (immortalized by Lisa Kaus in the multi-media piece above...) There sits the hot-rod of a laptop on a counter above one very messy drawer...truth be told. From this humble perch I run my little Earth Angels world...no big studio for me, sad to say. But, my entire home is my playground, with an ever changing seasonal palette and displays. Visit once and on the second trip don't expect to see the same things in the same spots...furniture migrates floor to floor, paintings change walls like I change shoes, powder-rooms don fresh paint overnight...nevermind the little vignettes that dot the hutches, cupboards and shelves. This is where and how I create, unwind and renew...in and around my HOME...Ulla has suggested I open the door to my home and take you all on tour through the blog...watch for more entries on displays and rooms that celebrate my personal style, and collections. And yes, please do send your images of home, and where you create so I can share them too. ...as we were getting ready for one of last year's parties, this huge and feathery velveteen-like moth flew about the house finding favorite spots to rest...yes, the one you can tell is moving among the sparkly and soulful creations from Jill Schwartz . This mini-me "mothra" seemed to harbor a mildly mad infatuation with Ashley Carter's glittery butterflies . Can you blame him? I confessed my own similarly passionate feelings for Ashley's winged Goldbug Studio creations in a recent confession to friend and fellow collector Gina Chambers (shown here with gal pal, doll artist Nicol Sayre). Gina has seen me, as all real friends should and still love me, at my best and worst...but Gina, I surrender, you are simply a faster runner than I! You fly! I am so glad you flitted into my life Gina, Nicol and Donna, and all of you that flutterby and fill my home with magic and joy...visit again soon.